Convert Doc to PDF, HTML, XLS, Image and Text on web-servers. When you need to provide multiple users with the ability to convert MS Word Docs into text, images, or table format, the Total DOC Converter X is exactly what you need. Because Doc Converter X is installed on a web server, it's possible for lots of users to run lots of conversion jobs all at once. Whether you choose to make it accessible to your entire network, or use it as a stand-alone application, the Total DOC Converter is the #1 solution for all your document conversions. Supporting a wide range of formats, Total DOC Converter X covers all your DOC export needs. Convert Word/DOC/DOCX/DOCM/TXT to PDF, XLS, HTML, JPEG, TIFF, RTF, TXT and Unicode TXT formats. Free of GUI or interrupting messages, the Total DOC Converter X lets you send instructions via direct access to the command line. This feature is perfect for server admins, or anyone looking to run quiet behind the scenes operations. You'll even have the option to create complex sets of instructions and let our converter process the job automatically. To add automatic conversion functionality, simply install Total DOC Converter X together with Total Folder Monitor. This lets you track files as they are placed into specific folders, and convert them on a regular basis; automatically. Total DOC Converter X supports ActiveX in a way that lets you integrate it into a web interface. This feature can help to make the converter a part of existing web applications or provide conversion services online. Adjust the conversion process according to your needs. With so many great options included, the Total Doc Converter X is a highly customizable, flexible tool that is certain to save you both time and money! Discover more options. If you'd like, give the program a try through our free trial version. You'll have 30 days to experience first hand how helpful our converter can be. When you decide to upgrade, you'll receive a lifetime license, access to our tech support team, and all updates are free during the first year. C.Convert "c:\source.DOC", "c:\dest.TIF", "-cTIF -log c:\doc.log"
If you use ActiveX on a web-server, please, remember to register it in your web-server account. If you don't have MS Office or MS Word installed on your computer, please download this additional free office converter pack to convert doc files. "Up to now, Total Doc ConverterX is doing the job correctly, that is converting Doc files to PDF files using command line within a Windows scheduled task, if I would have any problem I will certainly contact you. Thank you for the product." 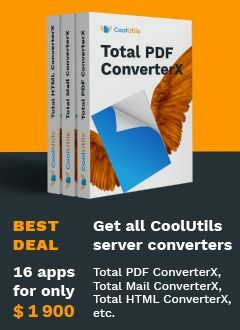 Total Doc Converter X converts DocX provided that you install this free Microsoft Office Compatibility Pack. Convert DOCX to PDF, TIFF, XLS or make DOCX files compatible with older apps converting them to DOC or TXT. Total Doc Converter X converts Doc to PDF and allows you ro sing the final document with your digital signature. Total Doc Converter X can copy original time stamps if you want to keep them. Have an outdated Microsoft Office 2003? Update all your old files to the new format in one go. Convert Doc files to DocX with our Total Doc Converter X.
Adjustable paper format for every target format: make the converted copies suitable for printing on specific paper. Total Doc Converter X can print out, fax to send to OneNote any file you select. It will also create detailed reports on your Doc files in PDF, XLS, CSV, TXT formats. It's the esiest way to learn how many files you have and their parameters. We offer many samples in PHP, C#, ASP so that you don't get lost in code lines. The widest list of supported file types: convert Word, Doc, DocX, DocM, RTF, RVF, or TXT files to RTF, DOCX, XLS, JPEG, PNG, TIFF, HTML, XHTML, PDF, TXT in a batch mode. Is there a more powerful doc converter for the same price? 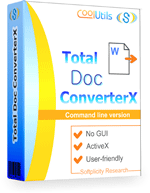 Total Doc Converter X supports several types of compression for TIFF. If you are at a loss the program will automatically choose the best value. Do you want more order? Total Doc Converter X will add page counters or a date to every page of the output files. The app is great for stamping legal bates too! Ability to compress converted copies when performing conversion to graphic formats: get the optimal size/quality ratio. Total Doc Converter X offers a lot of additional settings for Doc to PDF conversions. Set user permissions, password-protect your files or sign with a digital signature. Get PDF, PDF/A and non-searchable PDFs. Total Doc Converter X has no GUI and runs via command line. Convert DOC on VB.net. Save time, it's easy. Supported languages incude any language that supports Web Services including .NET (2.00, 3.5, 4.00), Ruby, PHP and Java. Need Doc conversion feature in your app? Get a royalty-free license. It allows you implement Total Doc ConverterX into your software and redistribute it. RFL is licensed per project (no matter how many developers are involved).